First off, I was on my honeymoon when I started this book… and my husband got a little annoyed because I wouldn’t/couldn't put it down! He told me I wasn’t allowed to start the second one until we got home (fair enough). With that being said, I think its safe to say I really enjoyed this book. There were a couple of things that I wasn’t sure about, but we’ll get to that later. In the first novel, Ceony has just been assigned her apprenticeship under the surprisingly handsome and talented Magician Thane. I don’t want to give away too much, but Ceony ends up having to test her paper magic skills earlier than she would have imagined. After Thane's heart is stolen, Ceony sets off on a mission retrieve it. The magician who stole Thane's heart forces Ceony to time travel through many of his memories, which is a little odd. I wasn’t quite sure about this part. Many of the memories helped the reader get to know Thane a little better, but I’m not positive they were completely necessary. The book definitely slowed down a little bit in the middle, but have no fear... it picks back up! 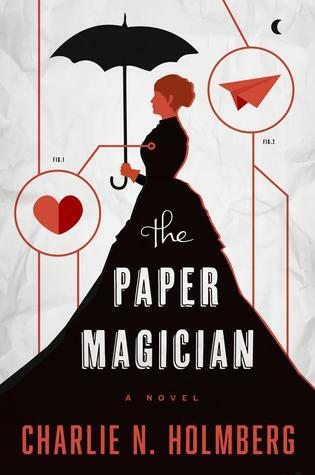 Things I liked: This book has the YA features we love: romance, magic, villains, and fantasy. It also has interesting features that are not like YA novels that we love. Paper magic? What? But I like it! I also really liked the paper dog, yep. Things I didn’t like: The time warp through memories... I just wasn’t sure about it. I also was a little unsure of the setting – past? Present? Both? All in all, this was a good read and I look forward to reading the following two books in the trilogy! *Rating 3.5/5 – I would recommend this to friends.